A warm honey-bronze color with lustrous sparkle provided by very fine films of iron oxide. The fibrous, fairly fragile Bronzite stone from Brazil is occasionally used in jewelry but excels as a watercolor pigment. It’s a warm golden-brown in masstone – somewhere between ochre and sienna, but distinctly different – that lets down into pale washes of soft, always warm, sandy beige. 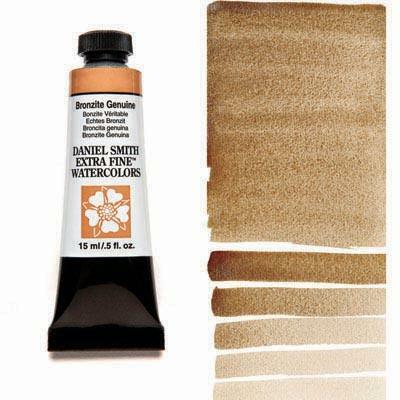 In a wash on cold press or rough paper, the brown settles out of this intriguing special-effect color.